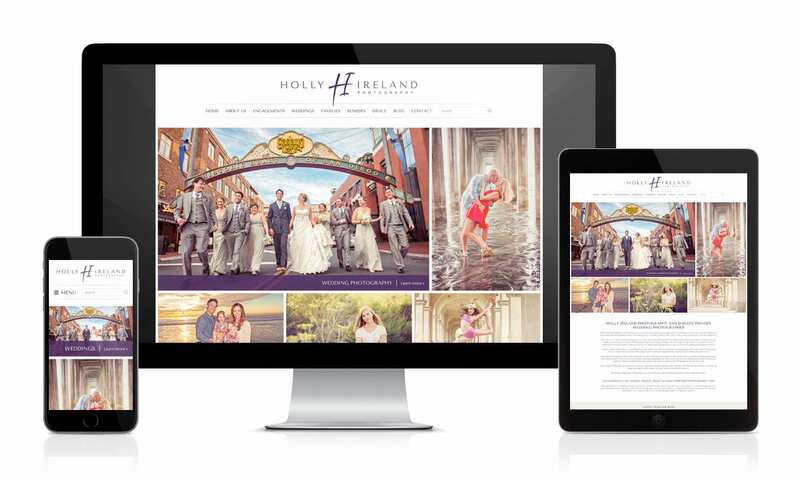 Visual Lure is proud to announce the redesign and relaunch of a new custom WordPress website for Holly Ireland Photography. Holly is our favorite San Diego photographer who specializes in engagement, wedding, family, high school senior and dance photography. Even though we designed Holly’s old site, it had become dated by how it was coded and the load times had become subpar. The new site loads quickly and the code is now much cleaner. We have already seen a huge spike in search engine rankings since the relaunch, which was one of the main reasons for the redesign. The old website ranked organically on page 3 or 4 of Google for “San Diego family photographer”, and since the redesign, you can now see it on the middle of page 1. The new site ranks #2 on the first page for “San Diego senior photographers” and any variation of that search phrase. (I would consider this #1 on page 1 as the first organic listing is Yelp). One of Holly’s passions is dance photography and if you search “San Diego dance photographers” you will not only see that her site ranks #1 on the first page, but also #2 and #3. Lastly, we saw a huge improvement on her rankings for “San Diego wedding photographer”. Her old site bounced between pages 4 and 5, and the new site has been bouncing between pages 2 and 3. From a design and development standpoint, the new website features a masonry collage on the home page with a cool hover effect, a sticky header for more user friendly and convenient navigation, a custom animated testimonials widget, fast loading masonry photo galleries and a quick loading blog landing page. On a responsive level, the new website renders much better on tablets and smart phones. Lastly, we would like to congratulate Holly on being named San Diego’s Top Wedding Photographer by San Diego’s A-List. This was no small feat as there were over 160 photographers in the running. Even more impressive was that there were over 45,000 votes cast. Again, kudos to Holly Ireland Photography (and her husband Bruce) for being ranked #1! Learn more about our Search Engine Optimization/SEO and custom WordPress web design services.